If you want to see the real Cambodia, round up some friends for a dirt-bike adventure through former Khmer Rouge territory to the stunning mountain temple of Preah Vihear. HIGH ON A WINDSWEPT hilltop in Cambodia’s Dangrek range near the Thai border, the stone windows of Preah Vihear temple have opened on the same impressive view for almost a thousand years. Green plains 1500 ft below stretch to the horizon, and a few faint dirt roads extend in impossibly straight lines before vanishing behind a curtain of humid, blue haze. Preah Vihear’s remoteness keeps the throngs of Angkor Wat tourists away. 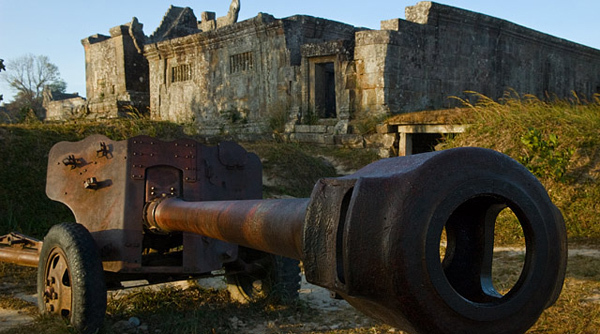 A few anachronistic pieces of rusting Khmer Rouge artillery dot the temple grounds, serving as a reminder that the hilltop hasn’t had an entirely peaceful history. Preah Vihear’s remoteness keeps the throngs of Angkor Wat tourists away, and if you’re ready to brave Cambodia’s notoriously bad roads on the back of a battered dirtbike you’re likely to score a hilltop temple sunrise all to yourself. Solitude never comes easy, though. Expect to end each day by unclenching your cramped hands from the bike’s luggage rack, rattled to the core by some of the roughest roads around and covered from head to toe in fine Cambodian dust. Adventure and hardship go hand in hand, right? Full disclosure – Preah Vihear is accessible without a visa from the Thai town of Si Saket on a paved highway. The border at Preah Vihear isn’t a true entry point, though. You’ll be allowed to enter the temple for a few hours to look around, but you’ll have to leave the same way you came. Also, only visitors from the Cambodian side will catch the sunrise since the border doesn’t open until mid-morning. Cambodia needs your dollars far more than it’s neighbor to the west, and the dirtbike pilgrimage from Siem Reap is an unforgettable adventure. Whoever coined the term ‘dancing roads’ to describe Cambodia’s unmaintained thoroughfares was a master euphemist. Backpackers have supposedly made it to Preah Vihear via moped, but ruts a foot deep or more swallow tires to their axles and destroy shock absorbers. There’s a fine line between adventurous and crazy: don’t attempt this trip on anything less than a dirtbike (or a 4×4 if you have a bigger group). Long days of riding will exhaust you, and it just takes one bad move to send you flying over the handlebars. With the nearest medical facilities hundreds of kilometers away in Siem Reap or Phnom Penh, this is best avoided. Unless you’re an experienced rider, hire a driver who knows what he’s doing. Whatever you do, don’t attempt this trip in the rainy season. Depending on your budget, you have a few options for finding a driver and bike in Siem Reap. Hidden Cambodia is a western run outfit, and will set you up with safety gear, guides, and bikes…all at premium prices. Rates range from USD 155 to USD 185 per person/per day depending on the number of travelers. On a tighter budget, consider Chaioffroadtrips. Chai is a safe driver, and you won’t meet a more friendly or honest Cambodian. Chai quotes USD 80 per person per day on his website. All of the above prices include bike, driver, gas, food, accommodation, and admission fees. Another option is to watch for locals riding around Siem Reap or Anlong Veng on dirtbikes. Most are amenable to negotiating impromptu trips for the right price. However you find your prospective driver, do yourself a favor and sit down for a beer or a cup of tea with him before committing to the trip. You’re going to spend at least six hours a day with your pelvis pressed into this guy’s tailbone…you’d better hope you get along. Also, try to get a feel for whether the driver you’re considering knows how to fix his own bike. From where you’re headed, it’s a long way to the nearest garage. The city of Anlong Veng 200+ km north of Siem Reap is home to a number of oddly non-judgmental monuments to the architects of the Khmer Rouge government, including Pol Pot’s grave. At Koh Ker, the ruined once capital of the Khmer Empire doesn’t see many visitors. Beng Mealea is a temple complex even more jungle-ravaged than Ta Prohm at Angkor Wat, and definitely worth a visit. Find a few of these spots on a map, connect them with a hand drawn line, and you’ve got the recipe for a dirtbike adventure lasting somewhere between 4 and 7 days. Most travelers choose to start and finish their trek to Preah Vihear in Siem Reap, but other options exist. If you’re headed to Phnom Penh, you could end your trip in Tbeng Meanchey and connect with onward public transportation. It’s possible to cross to/from Thailand near Anlong Veng, but onward transportation can be sketchy, so make sure to cross early in the day. Like most third world countries, Cambodia is a place where travelers must accept responsibility for their own safety. Thousands of landmines placed over decades of conflict litter the countryside. 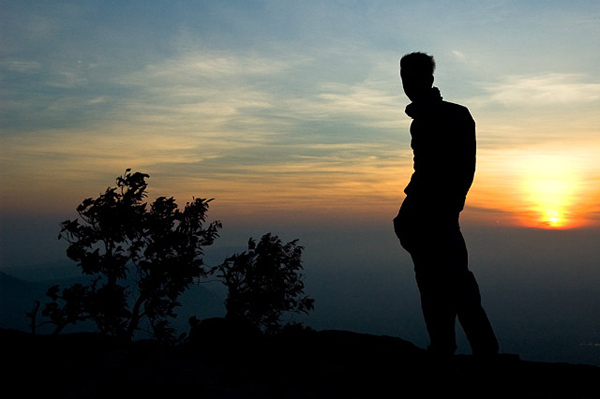 Solo female travelers in particular should be on their guard. Assaults, though rare, have been known to take place even around Siem Reap. There’s not a lot of trunk space on the average dirtbike, and you’ll probably wear your luggage on your back. Bring something to keep warm, and something to keep dry. A krama (checkered Cambodian scarf) is great for keeping the dust out of your mouth. 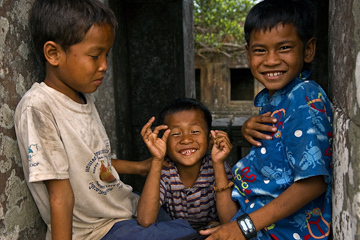 Bring a first aid kit; in Preah Vihear province you’re on your own when it comes to medical care. Accept that you’re going to smell like hell by the end of the trip and don’t bring much extra gear. You’ll feel every ounce of gear in your pack slamming down on your shoulders as the bike ‘dances’ over the Cambodian ‘roads’. Accommodations along the way are surprisingly not too shabby. In particular, don’t miss the guesthouse on the cliffs above Anlong Veng at what was once the ‘mountain house’ of Ta Mok, brother number four in the Khmer Rouge. Hammocks offer great views of the Cambodian plains, a cool breeze keeps the mosquitoes away, and the basic single rooms are clean. There’s a guesthouse in the ramshackle village at the entrance to the Preah Vihear temple complex where you’ll have to stay if you want to catch the sunrise from the temple. Both of these guesthouses cost about $4 usd per night, depending on your negotiating skills. 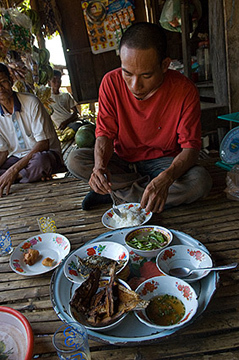 Food in Preah Vihear province (as in the rest of Cambodia) is simple but tasty: rice with various meats and vegetables. You’ll find restaurants in Anlong Veng and Tbeang Meanchey. Elsewhere it’s possible to buy meals from local families. In either case, it’s best to eat whatever your host recommends, as it’s probably the freshest food available. Travel guidebooks often suggest avoiding ice, but few things are more refreshing after a hard day’s ride than Crown beer poured over a single giant ice cube in a glass mug. In Cambodia, it’s traditional to clink glasses before every sip. If you slip up and drink without toasting you’re expected to down the rest of your beer. You have to love a culture that has ‘traditional’ drinking games. Cheers! MatadorTrips.com editor Tim Patterson has traveled to Cambodia several times and wrote a Backpacker’s Guide To Cambodia. Also check out his guide to Koh Rong, a remote island off the Cambodian coast.